Peter Maurin's mother and father were poor farmers in a village named Oultet in Southern France. As is often the case for those who make their living by the land, life was a challenge from sunrise and sundown that was punctuated with many moments of uncertainty and rare moments of quiet confidence. He was one of twenty-four children that indubitably did their best to help on the farm and fill each other's lives with the comfort and solace of the community of family. When he was sixteen, though, Peter departed his family home and joined up with a Christian group called "The Institute of the Brothers of Christian Schools." He trained to be a teacher and to move into some community in need of education and guidance and start a school. They professed vows of simplicity and piety as well as a passion for educating and caring for the poor. He found this life fulfilling but just as he was really beginning to enjoy the community he was conscripted into mandatory military service. He was uncomfortable with the nature of the relationship between politics and religion--how the State so often took upon itself the cloak of the Church in a manipulative and dangerous way--and this thread would run through the remainder of his life.When he was released from his mandatory service he found out, with much frustration, that the French government was shutting down religious schools throughout the country. Peter responded by joining a lay group known as Le Sillon which advocated for worker's rights and democratic ideals. Though he tried to assimilate into Le Sillon he could not escape the pervasive suspicion that the conflation of politics and religion created problems. So, in 1909 he emigrated to Canada to escape the political life that so dominated his existence in France. He had chosen Canada--specifically Saskatchewan--because they did not have obligatory military service or conscription and, so, it seemed to hold the promise of a life of piety without politics. He built a home and shared it with others but soon found that the life of escape was not one to which he was called even if he was still called to a life of poverty. He left Saskatchewan and began taking odd jobs in the United States or, in hard times, wherever he could find them. He worked hard and asked for little. When he was able and life and funds permitted him to do so he would go to New York and teach the poor the skills they might desperately need. Often, he was unpaid for this service because of the expansive quality of the poverty he struggled against. He would spend his time teaching in the public library or sharing his life and experiences with people on the streets. He had minimized his own interaction with politics while emphasizing his own relationship with his God and his Faith. One of the people whom he regularly had conversation with gave him the name and address of a new convert and freelance writer by the name of Dorothy Day. Peter sought out Dorothy and his life took another turn. The two developed an intense and passionate relationship as two friends and beloved coworkers in the Kingdom of God. Dorothy was a gifted writer and Peter had ideas that had true potential to rock the world. Before they did anything, though, Peter insisted that Dorothy receive an education about how to look at the world through truly Christian eyes. It was always Peter's insistence that the Kingdom of God operated on a different set of values and procedures. He didn't think that the old world and the corrupt systems needed to be conquered so much as allowed to destroy themselves.Peter taught Dorothy and others that the Christian way was to focus upon piety and faith and allow broken systems to self-destruct. This is how Peter and Dorothy proceeded and this is how Peter finally understood himself to escape the worst part of the painful grasp of the political machines. The two of them started The Catholic Worker and it soon became a widely read and appreciated newspaper. 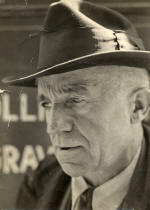 Through the paper, Peter advocated a return to the practice of Christian hospitality, the increased importance of farms, and the value of community among other things.Insisting that "there is no unemployment on the land," Peter moved to a communal farm in Pennsylvania and spent the remainder of his days aiding in the publication of The Catholic Worker, teaching those willing to hear, and advocating for the poor against systems that tried to undo them all. He died in 1949 and was buried in a second-hand suit in a donated grave.